Well I was beginning to wonder where the summer had disappeared to, but thankfully, over the last few days it has well and truly returned and we've been making the most of it. Well we're British, we have to because we're never really quite sure how long it will last for. That said, a little well timed rain would be appreciated of an evening, just so that I don't need to worry about remembering to water the plants. So Friday we decided to enjoy an afternoon with friends at the beach. We had arranged to leave at 2pm and meet them there. So pretty much bang on 2pm we step out of the door and head round to the car. Now the plan here was quite simple, en-route to the car have a catch up with the neighbour to make cat sitting arrangements. What I hadn't bargained for was desperately trying not to get caught up in a dispute over parking. Long story short, it took the best part of 20 minutes before we actually got in the car and out of the driveway. And yes, the cat arrangements were made. Finally on our way, we took the pretty route rather than the motorway and finally arrived at the beach just after our friends did. It was all in all, a lovely and relaxing afternoon, sitting on the beach whilst the kids all messed about in the water (bit scary as they were wading up to their thighs in the sea and none of them had swimming costumes or a change of clothes, but thankfully, none of them managed to fall in - a few close calls, but no actual dunkings) attempted to run up the sea wall and then discovered playing with seaweed and having seaweed fights was fun (or not, if you were the one having seaweed thrown at you). Sadly the time passed by too quickly and before we knew it, everyone else was packing up and leaving and we were the only ones left. So we followed suit, said our goodbyes and left the beach behind. Sunday was yet another glorious day, and seeing as our Max missed out on coming to the beach on Friday, we decided to go somewhere he could have a nice long walk with some new sniffs along the way. He does like to sniff anything and everything so a new route is always exciting for him and today was no exception at Riverside Country Park. Unfortunately, I only have two photos because Miss L and her friend were busy catching Pokemon. There seemed to be a lot of chatter going on about the Pokemon, but frankly, they may as well have been speaking in a totally different language as none of it made any sense whatsoever, but they were happy and, more importantly, out in the fresh air. 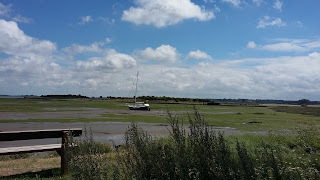 The park is on the River Medway estuary and has a wealth of wildlife. 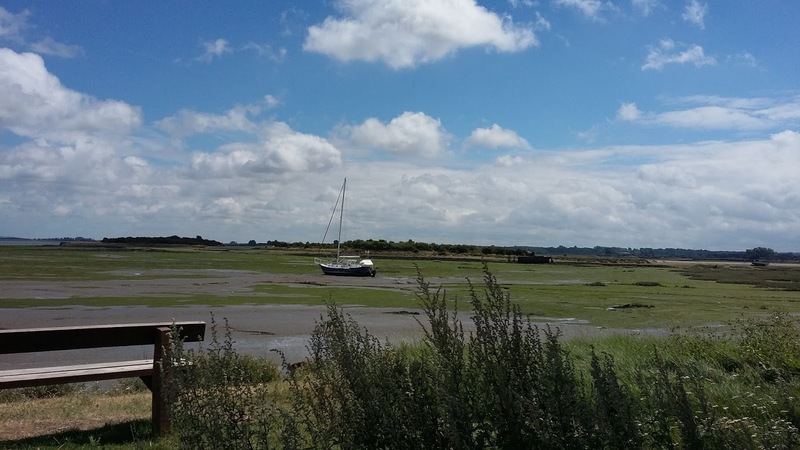 There's a choice of three routes you can walk or cycle, all of which run more or less alongside the estuary and offer some truly fantastic views; there's also a play park and a visitor centre with cafe. We often take a picnic with us and spend a few hours, but our focus this visit was to give the dog a nice walk. 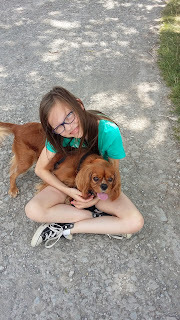 We walked for about half an hour, Max was in his element with so many new smells and was doing his best to tie me up in knots with his extendable lead and the kids managed to 'catch' some Pokemon. It was a very hot day though, and poor pup was starting to look a tad warm so we headed back to the car and gave him some water to cool down. The kids played hide and seek in the playpark for a little bit and we found a nice shady spot to watch them and cool down ourselves before getting back into a now quite warm car (or mobile sauna). Thank goodness for air conditioning! Arrived home for a cuppa, satisfied that I had achieved my goal of wearing out both Miss L and Max and enjoyed a nice quiet afternoon watching Rio 2016 with my eldest.